Spoonflower’s contest this week is to design a one-yard zigzag cheater quilt. I immediately thought of the turtle I’ve used in a few other desi gns. 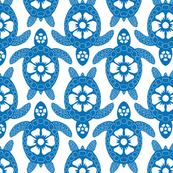 This post shows a Hawaiian design I made using the turtle. I figured it would be a fun motif to use in a zigzag design. We have friends visiting from out of town, and the two middle-school-aged kids like to do art projects. I thought it would be fun to show them how to do repeat patterns using their own drawings. They can use their repeat patterns as wallpaper for their computer or phone screens.